Early last week a NASA satellite orbiting Mars provided a game changing discovery. The satellite discovered evidence of flowing water on the planet of Mars. Scientists are happy to report that what they found may lead to many facts about the mystery of the planet of Mars. The satellite, known as Mars Reconnaissance Orbiter, took images of what appears to be water pathways running down the slopes of hills. These pathways, or streaks, seem to become darker in color during warmer seasons. As temperatures drop the streaks begin to fade. Scientists had considered the idea of these markings being caused by landslides or dust. However, chemical testing quickly ruled out the idea. Large amounts of chlorine and oxygen measure in the areas indicating that it was indeed a water-like substance. The fact that the color of the paths change indicates that the changing of seasons may influence water flow. The flow of the water is sporadic, and it has yet to be discovered why it disappears for a period of time. 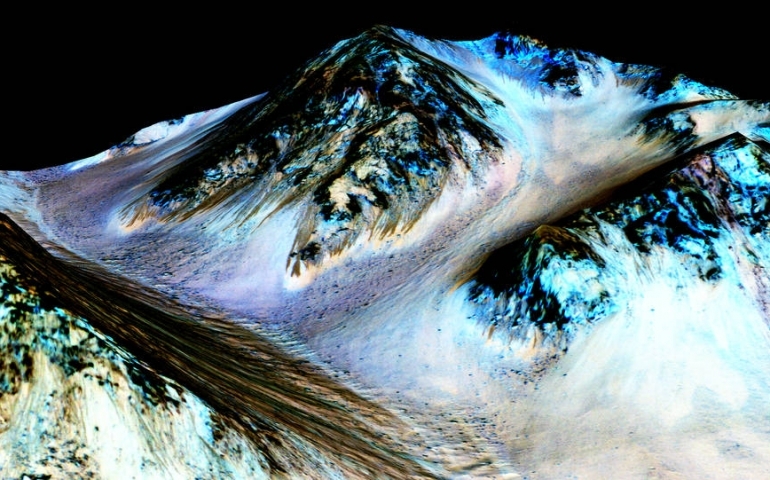 This is not the first time that water has been discovered on Mars. While it is unclear where the flowing water comes from, it is clear that the flow did occur within the past year. Past water discoveries concluded that the water is contained in the poles of the planet in a solid, ice-like form. It is also considered that Mars once was covered in water similar to earth. However, due to Mars’ low gravity and thin atmosphere it may have allowed most of the water to escape into space. Another theory is that most of the water on Mars is in underground aquifers. According to NASA, they are also becoming more hopeful about discovering life that is or once was on Mars. The conditions on Mars could not support human life due to the extreme amount of salt in the water. Yet life of other kinds is still possible. High concentrations of salt, or hydrated perchlorate, allow the water to have a lower freezing point. In the cold and dry atmosphere of Mars, the water is then still able to flow. The water can sustain organisms due to the low freezing point. Whether life on Mars exists or ever really happens, scientific evidence and technology are one step closer each day to reaching either possibility.